Back in the spring, when I started working on Birds of Beebe Woods, robins were in abundance, hopping around the yard. 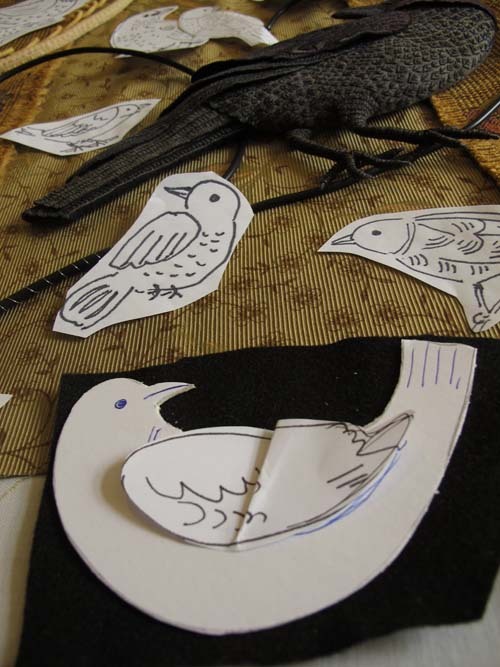 After making the larger, dominant crow, I added a robin to the piece, placing it in the center, down on the ground. Compared to the smaller, realistic looking birds that were made later, the crow and robin’s bodies are more abstract, with stylized patterns on their wings and breast. My approach to rendering the birds seems to have changed during the 4 months that I worked on the piece. Toward the end, when I sewed the nuthatch, chickadee and warbler, I referred to photographs more closely and was caught up in making them identifiable and naturalistic. I like to combine realism and abstraction. In keeping with the robin’s perky nature, I curved the bird like a sideways apostrophe, with its tail flaring upwards. 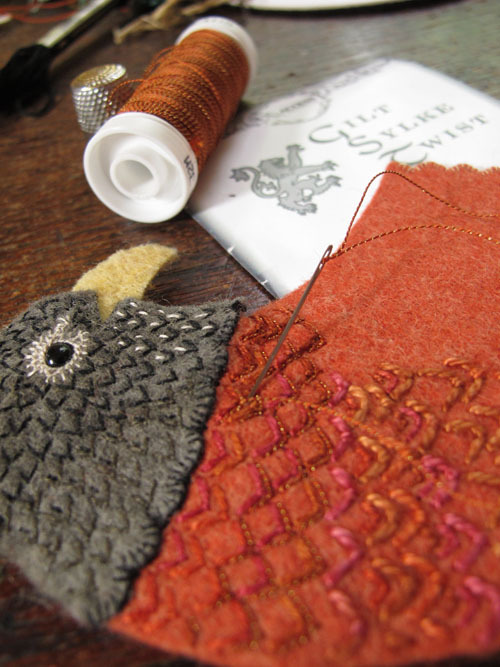 The red breast presented a opportunity to play around with warm tones and metallic thread. To see more posts about the making of Birds of Beebe Woods, see the archives here. A 18″ x 24″ poster (pictured at the beginning of this post) is available through my Etsy Shop. Note cards of details from the piece, including the robin, are also sold as mixed sets and separately. 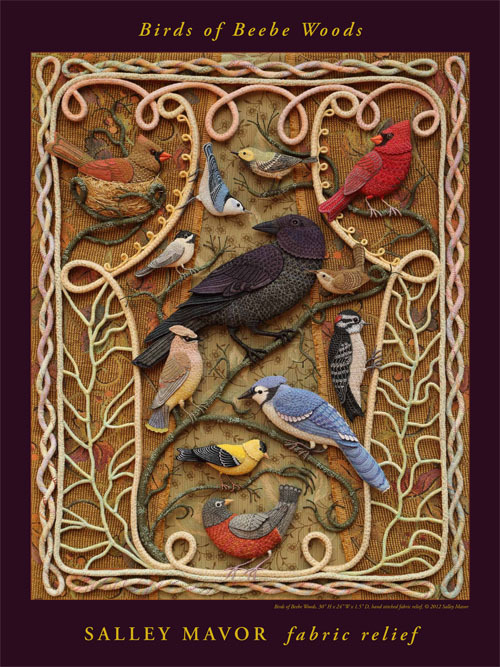 This entry was posted in Animals, Birds of Beebe Woods, Fabric Relief, Nature, Tutorial by Salley Mavor. Bookmark the permalink. So pretty! I’ve always loved a robin redbreast…beautiful work Salley. I agree with you. Its beautiful. I realy like it, Its wounderful. My Grand Mother would love it, She loves birds. Salley you amaze me with the details and thought you put into your beautiful pieces. Love to read about it, save it and read again later, you really astound me!! Gorgeous! Just love your work. I love seeing your birds. They are just amazing! You are Amazing Salley! I love your embroidery work..you use the right stitches to create the look you need to achieve. Salley I wanted to know as an Artist how do you say true to your style without getting influenced by other artist?. Your work is unlike any other I have seen out there. Thank you for checking in so often, Rebecca. As for your question about maintaining my style, it’s not a conscious effort, but a certain balance of design and mood does come through somehow. I don’t pay much attention to what other artists are doing, mostly because I’m too busy stitching. Also, the pictorial and decorative nature of my work makes me feel separate from the more edgy and austere modern trends in the art and fine craft world. But, every once in a while there’s something really interesting to look at! Salley, what a stunning piece of art! I have featured you in my recent blog post as research for the robin from the secret garden, who I am sewing at the moment. So inspired by your beautiful work!